A civil lawsuit that originally sought door-to-door delivery of bottled water to residents of Flint, Mich., was settled with a guarantee to replace 18,000 lead and galvanized service lines in the city. 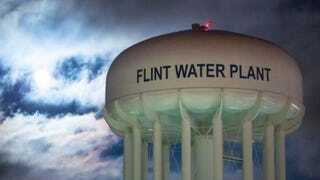 According to MLive, the settlement agreement was filed in U.S. District Court in Detroit on Monday, and comes close to bringing to an end the legal battle that Flint pastors, the American Civil Liberties Union and the Natural Resources Defense Council have waged against the city of Flint and the state of Michigan. On Tuesday, Judge David M. Lawson will hear a request to approve the settlement and make it legally binding for the city and the state to take specific actions. The Flint City Council voted unanimously last week to approve the settlement, and the Flint Receivership Transition Advisory Board did the same Monday. Late last year, Judge Lawson issued an injunction requiring the delivery of bottled water to any home that did not have an operating, properly installed water filter. Both the city and the state claimed that home delivery of water would create a hardship. None of the parties involved has issued a statement or comment on the settlement because Lawson’s orders forbid it until the agreement is formally accepted by the judge. According to MLive, the full settlement includes a stipulation that the state allocate $87 million to pay for the replacement of the lead and galvanized lines, of which amount at least $47 million must come from sources other than those approved last year by President Barack Obama and Congress with the continuing resolution. I’m finding it hard to understand how the plaintiffs conceded on the water-delivery request, when it was something they wanted to have in place while the replacement of the pipes was happening. There is still the issue of the people who don’t have a properly installed filter and also do not have a way to go pick up the free water that is allotted to them by the city and state. Replacing the lines is a long-term project, and in the interim, what are those people supposed to do?